The word ‘accessible’ in board gaming has multiple meanings. It may refer to the barriers, or lack thereof, those with impairments may experience in trying to play. That’s the definition we use. It may also refer to how approachable the game is for beginners. Memoir ’44, as we discussed in the review, is certainly accessible in the latter sense. Not only that, it’s very engaging – that’s what got it a hefty four star rating. However, is it accessible in the sense it matters for Meeple Like Us? Let’s find out. I say, isn’t that chap over there wearing a Nazi uniform? Or is he? It’s hard to tell, what. We have an overwhelming numerical advantage. Or maybe they do. One of us does. Maybe? Now, strictly speaking there are different form factors to the units (the Axis tanks look subtly different to the Allied tanks, and the soldiers strike different poses) and so it ticks the box for ‘colour is not the only identifying factor’. It’s not even close to being enough though. 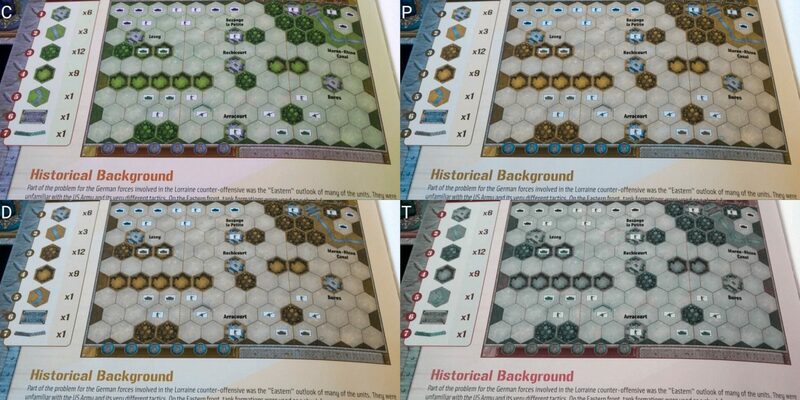 The manual uses green and black to differentiate troops in the setup – green for the allies, black for the Nazis. And then even with no other differentiation in the icons, you can still follow the setup plan. Why on earth would you not be consistent with this, when being consistent yields a much more accessible game? And remember, this isn’t ‘accessible to colour blindness’, this is accessible for everyone. We’ve made the point several times in the past that accessible games are easier to play for all players, and here’s a clear area where it’s true. 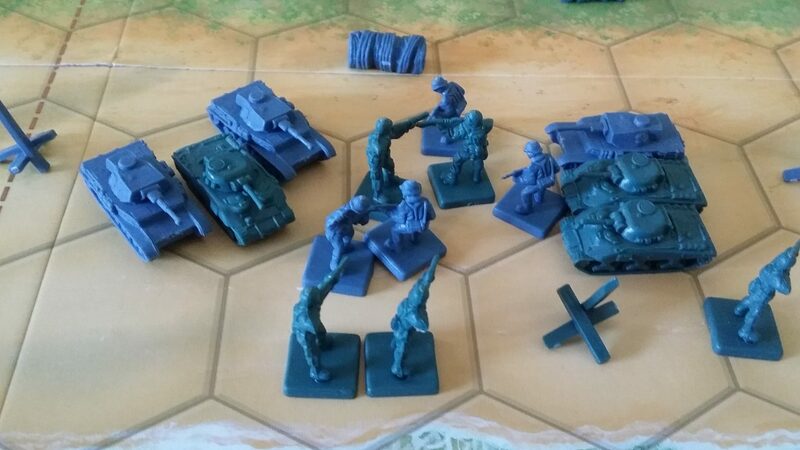 It’s telling that a quick search for Memoir ’44 and colour blindness on Google reveals a pile of people that have just spray-painted components a different colour. The Meeple Like Us view on that solution is that it’s far from optimal, but I understand entirely the urge. For many of the scenarios the colour issue isn’t a barrier to actual play, for the most part. You don’t have so many units that you can’t have a rough map of their location in your mind, and the stories the game generates from participation tend to reinforce positionality. Asking for guidance as to troop ownership in the edge cases though is one of those things likely to leak gameplay intention. Setup and clear up of the game is the area where this problem most clearly manifests. 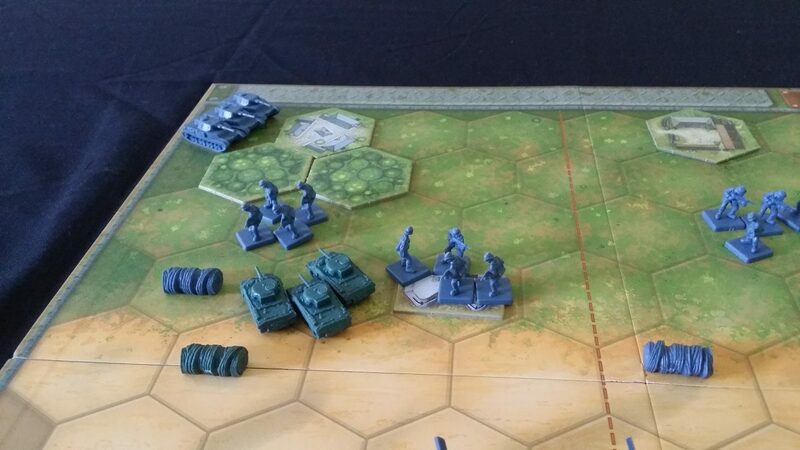 Terrain is better differentiated than the troops, having other graphical details to assist in identification. So, it gets a tentative recommendation, the most grudging one I’ve given so far. You can play it, but whether you are colour blind or not I think you are going to experience a considerable amount of palette based frustration. Visual accessibility is also not good. Troops tend to congregate in blocks, often around terrain and ornamentation such as the hedgehog emplacements. It can be very difficult, even for those without visual impairments, to tell at a glance what units may be which and what state each are in. I don’t care how many units we have. Just throw them at the Germans until we’ve won. Check out the massed units at the beach end of the centre section – they’re all at full health, and all of the same side. It’s still not easy to tell at a glance how many actual units are there. Once you’re in the thick of battle, with a couple of units having lost a soldier and a couple more adjacent to troops of your enemy, it becomes difficult to visually parse what’s going on. Hills and hedgerows are graphically differentiated, but not so clearly defined that they’re going to be very visually accessible. Close inspection is going to be needed, especially on map squares that have a similarly coloured background. Higher contrast between terrain types and the underlying map would have been good here. 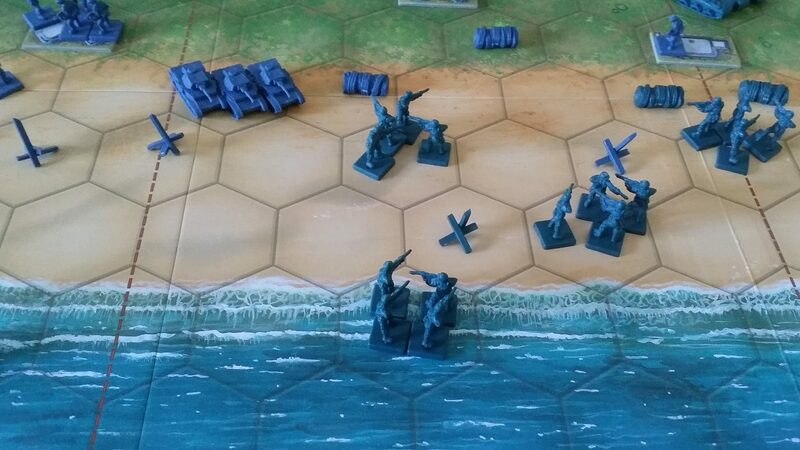 That’s not true of all terrain hexes or maps – the beach hexes for example are very easy to see, and cities and bunkers stand out against well against the green background. More importantly the game requires a lot of awareness of what’s happening in each section of the map. That’s going to need an ability to tell at a glance the number, disposition and battle-readiness of your troops. The colour problem makes this difficult, but so too does the grouping of units into adjacent hexes. You can move in closer to inspect the troops, but you may very well leak your game intentions in doing so. If you can’t clearly see the hexes you may also end trying to move multiple units together as one when you gather them up. Cards are uniformly well contrasted, but some come with a lot of quite specific text that needs to be read and comprehended. The terrain reference cards contain quite a lot of information that needs to be parsed, often with relation to specific unit types. This isn’t necessarily a major issue. A little familiarity with the game will allow internalisation of the rules. They’re not very complex in and of themselves. God, just tell me how many people I killed. It’s mainly an issue with the tactics cards. They’re going to need close examination with an assistive aid and the fact you’re doing that will reveal info to your opponent. ‘Three cards that needed close examination? That’s three tactics cards in their hand’. The good news here is that don’t have a huge number of cards to deal with, and the substantive majority of your hand remains the same turn to turn. You’ll still need to investigate the specifics of instructions before you consider playing them. At least once you know what cards you have you don’t need to worry about that information becoming obsoleted too quickly. The game makes use of non-standard dice – as usual, you can use whatever accessible version of the dice you happen to have available and construct a lookup table, but that’s going to have an impact on game-flow if having someone call out the results isn’t an option. Overall, we hummed and hawed over whether this is a C- or a D+. We’ve chosen to err on the side of caution and go with the lower grade for this section. That’s given the importance that visual differentiation plays in strategical assessment of positions and how difficult it can be for even fully sighted people to tell troops apart at a distance. Memoir ’44 places a considerable burden on fluid intelligence. There’s the obvious cost, which is that in order to play well you need to master the context of positional warfare. You need to use your cards well, command your troops wisely, and react with consideration to enemy action. It requires you to improvise based on the cards you have, and still maintain momentum of play. That’s going to be difficult for those with impairments in fluid intelligence, and long-term strategy can be hard to manage for those with memory impairments. The rules for each unit are different in terms of how they move and battle, as are the number of dice rolled, as are the way in which they interact with terrain. 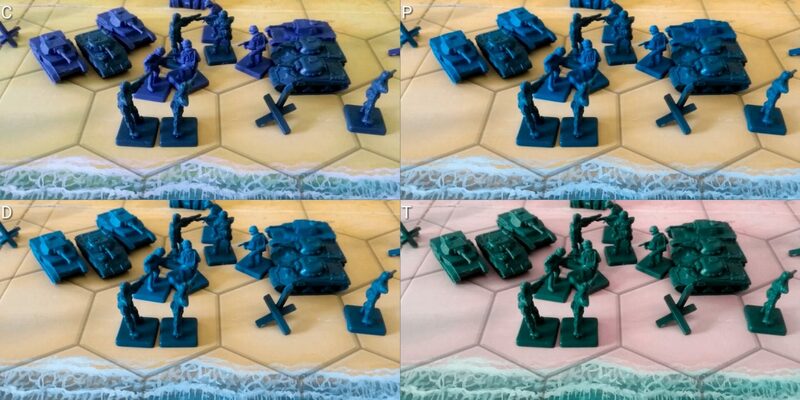 Tanks may move up to three hexes, unless it’s over a beach in which case they can move two. Infantry can pass through hedgehogs as if they aren’t there, but armour and artillery can’t move through them at all. 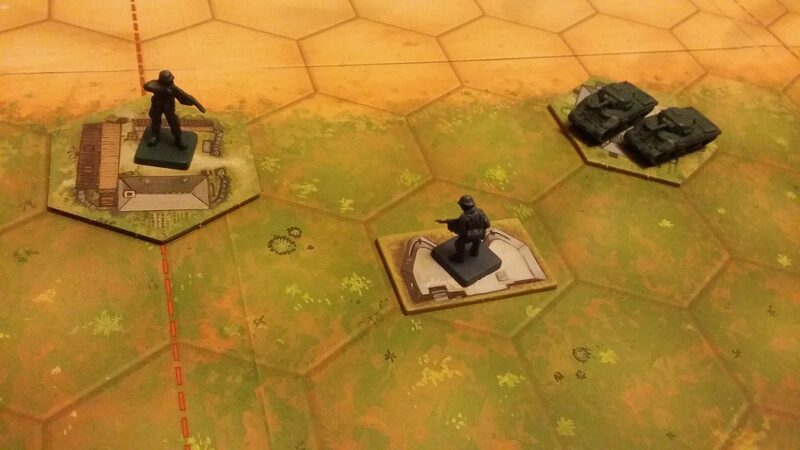 Bunkers force attackers to roll fewer dice, and the number is dependent on what unit is firing. Those inside can ignore a retreat flag. Armour clears away barbed wire automatically, and can battle out at full strength. Infantry have to choose whether to remove wire, and battle out at -1 dice. When defeating an adjacent unit, or forcing it to retreat, infantry and armour may choose to move into the unoccupied space. None of these are complex in any individual case, but they can easily compound. There’s no rule synergy though, which alleviates some of the issues that often comes from compound conditionality. Nothing that says ‘If you are the target of an air-strike, in the next turn you may…’, sort of thing. Coupled to this some troops are ‘special’ and come with their own slight variations. The special forces we saw on the board but didn’t see in action during the review can move up to two hexes and still battle. This marks them as distinct from the normal infantry which can move only one if they still want to battle. Different kinds of troops may have altered levels of health, special retreat rules, and so on. All of this is scenario specific. The picture below shows one such example of compound complexity – I also took this picture in a room with a different lighting configuration to show how easily the colour accessibility alters. This was entirely intended, and not simply because I couldn’t be bothered walking the ten feet to the kitchen where I took most of the other pictures. The germans are in the bunker. God, these colours. We have a German soldier in a bunker. We have tanks in a village, and an infantry unit in another village. The tanks battle out at -2, and are at range two. That would give them a single dice. But bunkers are also at -2 for those tanks attempting to target opponents within. The infantry on the other hand have no penalty from being in a village, and the bunker only removes one dice. At range two, they’d normally have two dice but the modifiers bring it down to one. If the bunker was closer to the tank’s village, it wouldn’t make a difference. If the bunker was closer to the infantry village, they’d roll two dice instead. Every time you consider an action, you need to take into account line of sight, movement and terrain modifiers as well as temporary obstacles such as barbed wire. There are reminder reference cards for each thing, but you still need to work out the implications of all your actions. And believe me, if you want to play well you need to be aware of all of this. The only way to really compensate for poor strategic options is to make sure each good decision counts. The command cards which drive the Memoir experience come in two flavours – section and tactics cards. These allow you to either play deeply in individual sections, or broadly across the whole map. Section cards are straightforward enough, but tactics cards often introduce triggering clauses and conditions, and may require dice to be treated differently. Sometimes they alter the number of dice rolled, or the flow of game turn execution. ‘Behind enemy lines’ as an example allows an infantry unit to move three, then attack, then move another three – all the while ignoring terrain movement restrictions. 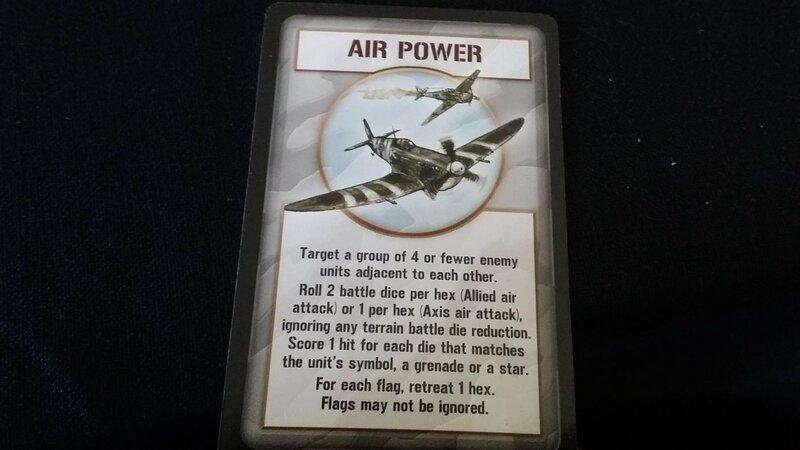 Their Finest Hour triggers a number of units dependent on dice rolls, and the number of dice is dependent on your command deck. There’s a fair degree of reading required to understand the tactics cards and to correctly execute their instructions. Game flow is highly dependent on the cards played, and where your units are located. Nothing about it, other than player order, necessarily remains the same turn to turn. Different numbers of dice will be rolled, different numbers of troops will be controlled and in different sections, and some cards even allow you to draw multiple replacement command cards and discard the worst. The manual does come with some simplifying variants that could be appropriate for easing play. The manual recommends removing tactics cards from the deck, and ignoring the armour overrun and take ground actions. That’s all fine, and certainly reduces complexity, but it doesn’t address the compound conditionality of the unit and terrain intersection that is core to the game. The game does come with a large number of reference cards, which is good, but hides much of the scenario specificity in the manual. The board itself doesn’t offer many reminders in the way of victory point totals and the way particular special forces will behave. In the first scenario, for example, we played with the Nazis having a crushing logistical penalty. The scenarios starts the Nazis off with only two cards to represent surprise, and then you got to draw additional cards up to a four card hand limit as turns go by. We missed that part. There’s nothing you need to memorise since it’s all documented somewhere. While they may be some high-end game advantage to tracking which cards have been played across both sides, there are also cards that will reshuffle the discards back into the common deck. Card counting is not a reliable measure. Largely you play with the logistical choices you have in front of you. You might be able to deduce what cards an opponent has as the deck runs out, but it’s dubious as to what real advantage that would afford you. We offer a recommendation for those with memory impairments. Long term planning may be difficult, but you can meaningfully play a game in which you’re focusing primarily on short-term objectives. We recommend you stay away if you’re considering the game for someone with cognitive impairments, even if you play with the stripped down rule-set. Even leaving aside the cognitive cost of developing an effective strategy, the simple mechanics of the game are likely to be seriously burdensome. Many of the issues we discussed in relation to the X-Wing Miniatures Game raise their heads here. It’s a game in which superior tactical and strategic execution will win the day, but moderated through the medium of random dice rolls. It’s your job as commander to make sure that you mould the battlefield in such a way as to skew those rolls in your favour. Controlling the ebb and flow of combat is more important than the strict random distribution of results the dice bring about. But, the dice are important and it can be very frustrating to execute a perfect command only to find that with a cumulative total of nine dice you only managed to kill a single tank. It’s especially frustrating too given that you may have exhausted strategic options in the process. Within X-Wing, the cost is opportunity. In Memoir, the cost is losing some of your logistical flexibility. If you bank too much on the success of even a powerful card, you may find yourself thwarted. Consider Their Finest Hour, which we saw in the review – a good roll can change the tide of battle. But you could easily roll all flags and grenades, at which point it turns out your finest hour involved everyone staying at home with their thumbs up their arses. You need to adapt to the cards you draw, and some hands are going to be better than others. Sometimes all you can do is look on in despair as you’re pounded in one flank with no meaningful ability to counter-attack or even retreat. Logistical inertia means that if you need to get rid of a whole hand of useless cards you’re going to be battling at a glacial pace. Most of the tactics cards have an option that says ‘If you have no valid units, order a unit of your choice’. That will seem slim compensation when your opponent is merrily hurling legions of tanks at a time down your exposed flank. Sometimes all you can do is just watch your troops being torn apart, with no meaningful ability to influence the outcome. As we discussed in the review, this is a great feature of simulating logistical complexity. It represents anything from communication lines being cut off, to units in rout and disarray, to commanders being killed in action. It’s very clever, but it does leave you lacking in options to change the outcome if you just don’t have anything worth playing. Worse, you can even enter the game like that and in the process of playing poor cards to open up new opportunities you may find that you’ve left yourself no strategy you can meaningfully execute. You’re never left with no options, but sometimes you might have three or four bad options. You can be shot, stabbed, garrotted or kicked in the crotch – pick one. Battles in Memoir can turn on a sixpence, but they can also progress with the grim inevitability of a train derailment. If you don’t have the cards to meaningfully attack, you also likely don’t have the ones to meaningfully retreat. Retreat is key to keeping victory points away from your opponent – you need to be constantly refreshing your front line with fresh troops. If you can’t do that, you might find that you’ve lost three or four units without inflicting a single meaningful fatality against an opponent. As such, while score disparities are not numerically high they are often emotionally high. Fundamental imbalances in scenarios are evened out through match based play but you can’t discount the psychological impact that comes from having just experienced a crushing loss. All of this said, we still offer a recommendation for Memoir ’44 – the times when everything goes against you are relatively rare in comparison to the far more common scenario of playing with a mix of good and bad. It requires a conjunction of your opponent having a deck of great options at the same time you have a deck of terrible options for the worst excesses of this to manifest. Physical accessibility is a combination of good and bad. So let’s start with the positives. My favourite thing about it in this respect is that it comes with its own card-holders! They’re not very good, mind – if you play a lot of games you’ll want to invest in something better. But it comes with three independent sections you can hook together to make one long command rail. That’s a very nice touch, and even improves the thematic experience. It just feels more realistic to be peering at a line of possible options rather than idly shuffling through a few cards in your hand. The game board is quite large, but for the largest portion of the game your troops will tend to be congregated into sections of it. A few scenarios have troops spread widely around, or surrounding a fixed emplacement of an enemy. Those will require an ability to either reach over the board or maneuver around it unless someone else is to act on your behalf. Mostly though you have your side and their side, and progress from one to the other is slow and unreliable. With X-Wing, the nature of ship combat and momentum meant very fast traversal of a map and slow turning back into combat, ensuring a wide range of map traversal for both players. That’s not the case here – you need to make a concerted effort to fight out of your half of the map. That means if you’re seated at one side you’ll be able to do most of your manipulation from a fixed position until later stages of the game. Well, the positives didn’t take long. Let’s move on to the negatives. First of all, you’re moving multiple figures at a time and when you take into account removable terrain and bunkers and the like it can be difficult to do this precisely. Some units come with special forces badges which need to move along with them –hexes can easily become very crowded. Adjacency of units can lead to a bunching up of models, and it’s really easy to nudge a soldier from one unit into the hex of another as you’re moving things around. You need to be on your guard. For the simple joy of the thing I’d recommend the use of a croupier rake like you see old-timey generals using in war movies. I can’t actually find one at a price I’d be willing to pay for occasional war-themed role-playing, but if you have one available it would make things easier. Unlike X-Wing, there isn’t a huge amount of meaning in the precision of troop placement – it’s a hex-based rather than ruler based system. That at least alleviates some of the precision problems that may come with moving troops around. When troops are damaged, they discard figures – as time goes by, they become easier to move. This does mean though a lot of reaching over the board to pick up dead soldiers and discard them. Generally too you’re not going to want to rely on the soldiers that have the fewest health due to the victory point system – that skews physical interaction onto the units with the largest physical inaccessibility. As usual, we consider here the ease of verbalisation – unfortunately, it’s not high. 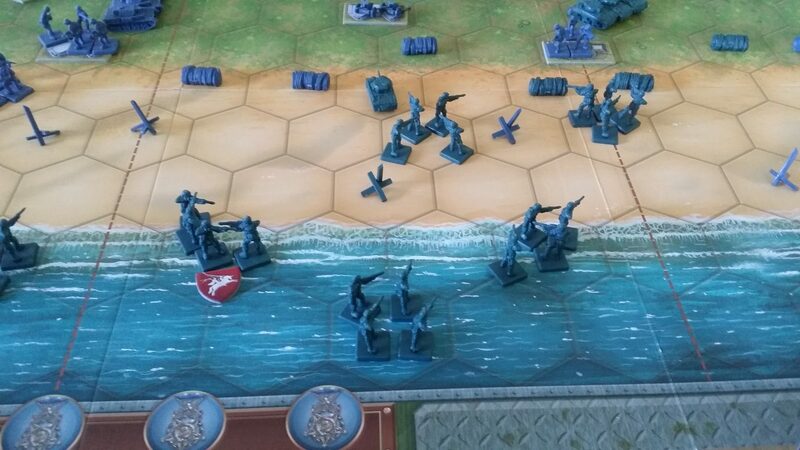 Memoir ‘44 is absolutely a game where you’d expect thematically for the map to have co-ordinates. It doesn’t, although at least it is subdivided into sections. It’s not easy to refer unambiguously to specific units, but it is at least possible. God, I give up. Shoot everything at everyone. Co-ordinates would have made it much more elegant as well as offering an unusually nice opportunity for entirely thematic role-playing for those with impairments. Imagine barking an instruction such as ‘Order the infantry at co-ordinates B12 to B13, and then have them attack the armour unit at D14’. And then imagine having some fake-corporal actually turn your words into actions! What could feel more like a general surveying war reports than that? Nothing, that’s what. It’s a missed opportunity that would have cost nothing to grab. There is also a curious scenario in the rules that requires the player to simulate an airdrop by taking a handful of units, and physically dropping them on the board. Where the troops end up defines some of the starting state of the game, and if they drop off the map or into already occupied spaces they’re lost. It’s an unusual setup rule, and not representative of the majority of the game, but it’s worth noting if only because it made me raise an eyebrow as I read through it. Expansions and such to the game may well introduce other physical simulation of game events, but I can’t speak to that. So, we offer the most tentative of tentative recommendations here – we wouldn’t recommend it all if agency is desired, but you can play it through verbalised instructions even if it might be awkward to do so on occasion. The game is obviously hugely slanted towards a male artistic representation, but I think given the theme it’s excusable here. This isn’t a game where you could have meaningfully had a more balanced portrayal without running into issues of tokenism. The few cards where it might potentially have made sense (such as the medics and mechanics card) wouldn’t have worked due to the implication of contemporary front-line service. It’s true that the Red Cross was staffed with many brave women working in front-line hospitals, but to my knowledge battlefront medics were exclusively male on both the allied and axis sides. I’d be very interested to be corrected on this score though if someone has better information – leave a comment if you do! 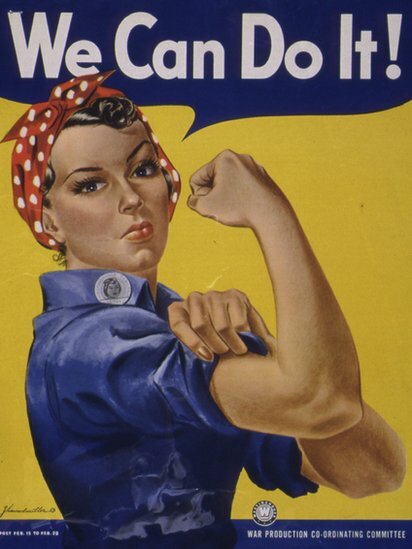 Likewise, many women served as mechanics during World War II, but again my understanding is that front-line mechanical work was exclusively male. Once again, please correct me if I’m wrong there. Memoir ’44 has some reasonable educational chops, and so while you could probably have a game that is meaningfully similar with a different conflict you would lose a lot of its instructional value. The historical information given for each scenario isn’t particularly deep or complex. When taken collectively they provide considerable insight into the nature of war. Especially war conducted at a time when communication wasn’t routed at light speed through encrypted satellites and beamed directly into the brain-stems of commanders. The command deck by itself is a teaching tool of considerable sophistication for illuminating the complexity of battlefield instruction. As such, while I criticised Splendor for not making an effort to be more inclusive, that was because it could be done without compromising any of the theme. Memoir ’44 has an explicitly gendered portrayal, and that’s fine because it is fully justified by context. Having said that though, the whole ‘guts and glory’ aesthetic of the box-art is likely to turn some people off. I was one of them. It just seems a little gratuitous and unnecessary. 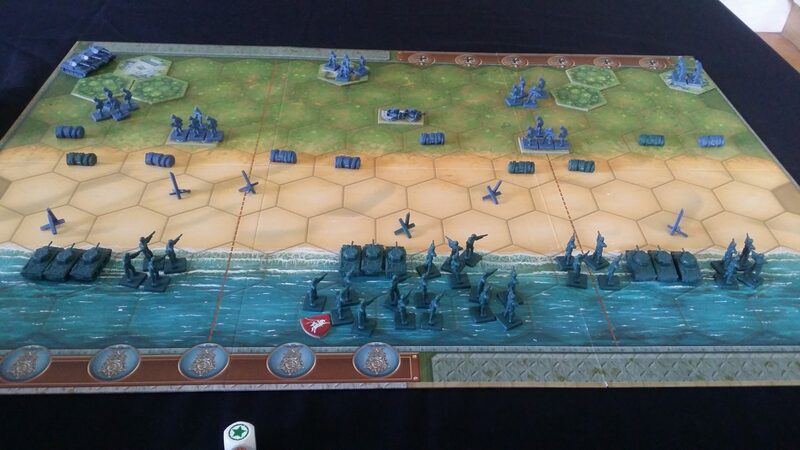 After all, we’d had the amazing Band of Brothers miniseries for years by the time Memoir 44 was published. With that came a far more nuanced and sensitive portrayal of what atmospheric war artwork can look like. 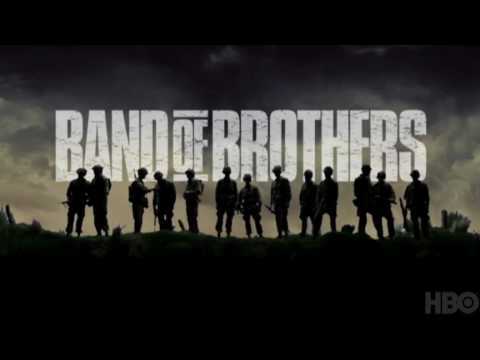 Seriously, if you haven’t watched Band of Brothers go do it right now. It is AMAZING. There are scenes in it that will make you weep. You’ll just need to remember it’s an American production and, bless their little cotton socks, they still seem to think they were the ones that won the war in Europe. No, it wasn’t the British either. It was the Russians but you’d never really know it from Hollywood. The game is balanced around two players, regardless of the variant team modes discussed in the manual. It’s too small in scope to really permit meaningful team-play with a single box. Nobody needs to be left out, but decisions become so small and irregular that they’ll probably wish they had been. Much larger battles are possible if you buy a second box, but you’d also need the supporting campaign books and expansions. As such, what you’re paying for with the base box is a two player experience. At an RRP of £45 you’re paying an awful lot per player. But you have to look on it as part game and part education, and it comes with a whole pile of scenarios that will round out your understanding of the European conflict. We recommend it in this category, in other words. There’s a required reading level on the cards, but no other fundamental need for communication. Even in team play, the nature of the command cards mean that simply pointing to a card conveys a huge amount of tactical and strategic nuance. You can play it in sullen silence, but I think you’d get a lot more out of it if you’re prepared to do a bit of role-playing as you participate in the battle. I know it’s not politically correct or such to refer to your opponent as ‘The dirty hun’ or ‘the damnable Bosch’, but it is on occasion hilarious. As a Scottish couple, I also found referring to Mrs. Meeple’s allies as ‘The filsy Englanders’ was a singularly effective taunt. The colour blindness issue we discussed above becomes compounded if paired with memory impairments. Dealing with unit positions is facilitated by remembering which units are yours, and how they fit into the broad thrust of your strategy. That’s very difficult to do if you can’t actually remember either of those things. The poor visual differentiation of the models then serves to complicate play where we would expect it to assist. 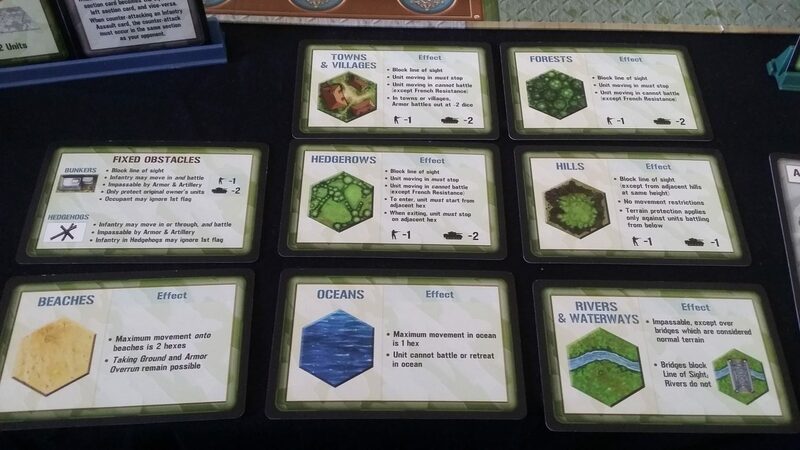 For those with other kinds of visual impairments, the conditional complexity of terrain can be difficult to manage due to the considerable content on each reference card. You may also need to cross-reference unit type, the terrain of the firing unit, the terrain of the targeted unit, along with any special forces modifiers. The reference cards support cognitive accessibility, but they‘re not necessarily easy to visually parse. There are numerous symbols used throughout, which may create an intersectional complication for those with cognitive and visual impairments. However, they’re mostly visually distinct and there aren’t a lot of them. Abstraction of symbols as a general rule is not a significant issue. The game makes use of hidden hands, and these hands have considerable importance. Those with both visual and cognitive impairments may find it difficult to request assistance in a way that won’t impact on secret game state. The largest intersectional issue is also the most common – there’s no real ability to drop in and out. Team play is possible, but not optimal, so generally you’re handling the game in a duel. The game battles themselves are reasonably nippy, coming in at perhaps 45-60 minutes each. The game though suggests match-based play to even out systemic scenario imbalances. As such, you need to budget roughly twice as much for ‘fair’ play, along with whatever extra is needed for accessibility compensation. That’s quite a long time, but it does have a natural break point built into it – there’s no reason the two matches need be conducted back to back other than to minimise setup time. As such, there’s nothing really here to exacerbate physical, emotional or cognitive distress. That’s good, because the game is over once a player drops out unless there’s a team element, or unless someone can step in for them. The colour blindness issue could have been so easily dealt with through choosing a more contrasted palette – with only two sides, it’s mind-boggling that this should have been the direction they went. A few adornments such as co-ordinates on the boards and perhaps a more elegant way of moving units and tracking health would have made it much more physically accessible. The rest of its inaccessibilities are mostly embedded into the design and couldn’t really be addressed without fundamentally altering the nature of gameplay. 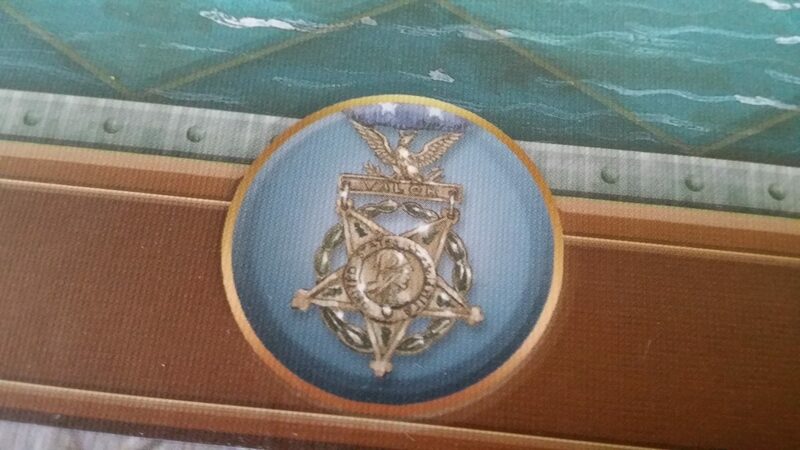 We gave Memoir ’44 four stars in our review. It’s a Full General, in other words. Even if you don’t much care for the theme, and the idea of playing a wargame leaves you cold, we’d recommend giving it a try. I felt much the same way, and it won me around. I think it might do the same for you.